In recent years, analytical reporting has been evolving into one of the most important business intelligence components that has compelled companies to adapt their strategies based on data-driven insights. While many companies struggle to leverage an effective business intelligence strategy, the importance of analytical information created fluctuation of data that cannot be simply collected into a single spreadsheet. It has become harder to create and use a single report and communicate a wide range of vital information between departments, stakeholders and important parties in a single company. That’s why a business needs a proper analytical report that will help filter important data and improve the creation of the full management report that can lead to a successful business operation. That doesn’t mean that creating these kinds of reports should only be intended for specialized analysts, who can read and interpret complex data more swiftly, but with self-service bi tools that expand the knowledge of all employees in a company, analytical reports can become one of the most invaluable reporting tools that force progress, directly affect operating costs and use modern interface which everyone understands. Exclusive Bonus Content: Want To Build Your Own Analytical Report? Download our free checklist on how to create a stunning report! An analytical report is a type of a business report that uses qualitative and quantitative company data to analyze as well as evaluate a business strategy or process, while empowering employees to make data-driven decisions based on evidence and analytics. While analytical reporting is based on statistics, historical data and can deliver predictive analysis of a specific issue, its usage is also spread in analyzing current data in a wide range of industries. For example, a hospital has seen into their report that the average waiting time can be reduced by conducting specific actions. Harvard University even stated in its own research that the total waiting amount is 121 minutes. A marketing agency can decide to allocate their budget differently after the team has seen that the most traffic comes from a different source of the invested budget. Applications of these kinds of reports are different, and, therefore, the writing style and generating data is distinctive in every industry. How To Write An Analytical Report? An analytical report can be written using a spreadsheet, whitepaper or a simple Word file. But, using these traditional means of writing a successful report can be time-consuming, information can be structured in a vast number of spreadsheets, and the final result can be more confusing than productive. 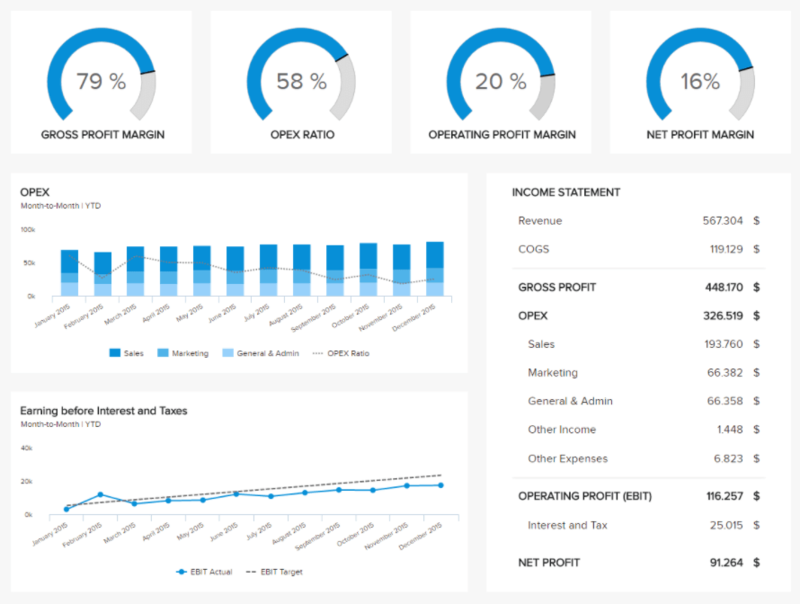 On the other hand, an online dashboard is a visual tool and can replace classical (written) business reports, as you can easily derive recommendations from it. How to write an analytical report becomes one of the most important part of the report creation, and therefore, using an online reporting software can effectively reduce the amount of time needed to generate an efficient report, with clear information and filtered data that can visually and interactively bring the most important analysis – in a heartbeat. Traditional reports have a standard structure which you cannot edit once it’s done, and it usually consists of a title page, table of contents, introduction, methodology, body section, conclusions, recommendations, and bibliography. With an interactive dashboard reporting software, the structuring can be far more simple and holistic. You can keep all the conventional and standard information you need, but the dynamism will provide details you can access in real-time and dig deeper while you click on every separate aspect of the parameter, or analytical information you need. As mentioned, these kinds of reports can be used in many industries that are finding analytical reports essential for a healthy business development. Let’s explore this through 4 different analytical report examples. 1. Healthcare: How to reduce the patients waiting time in our hospital? The healthcare dashboard above emphasizes healthcare metrics which combine historical data, statistics and delve deeper into the analysis of trends, therefore, can serve as a fundamental part of generating future decisions which are important to run and modify a successful hospital strategy. 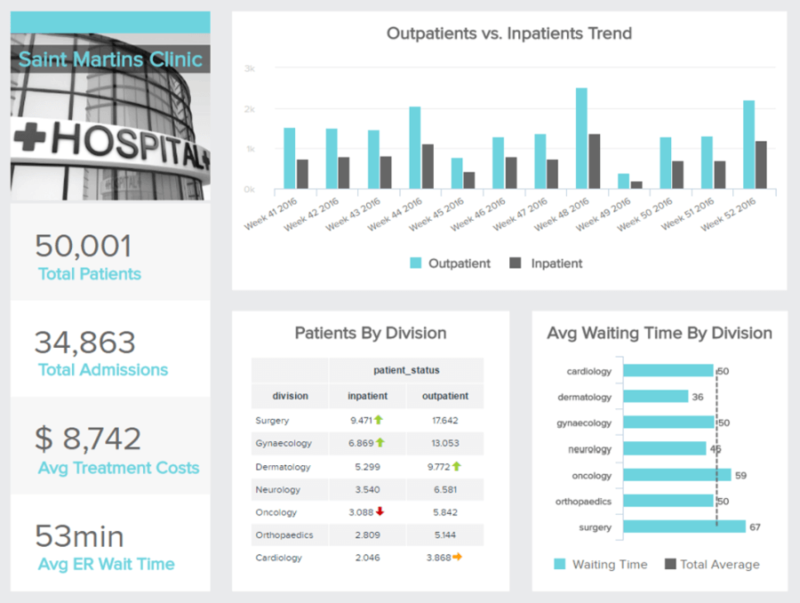 Although big data in healthcare are becoming expansive and increasing in the variety of information it can provide, it also uses reports in a form of a dashboard (like the one above) so that every analytical information generated has its own measurement and quality of evidence. The average waiting time by division can clearly increase the effectiveness of different hospital departments if used correctly. Also, the number of patients can explain why some divisions have the bigger amount of waiting time, and, therefore, propose a solution to reduce it, and also reduce costs that directly affect the department. This metric is important for the finance department, but the holistic view of all the analysis created and presented in this dashboard will help management make better decisions. This dashboard can also serve as an analytical report template, which can then be used as a roadmap to a successful hospital strategy. 2. Sales: How to exceed targets next year? Another analytical report example comes from the sales industry. 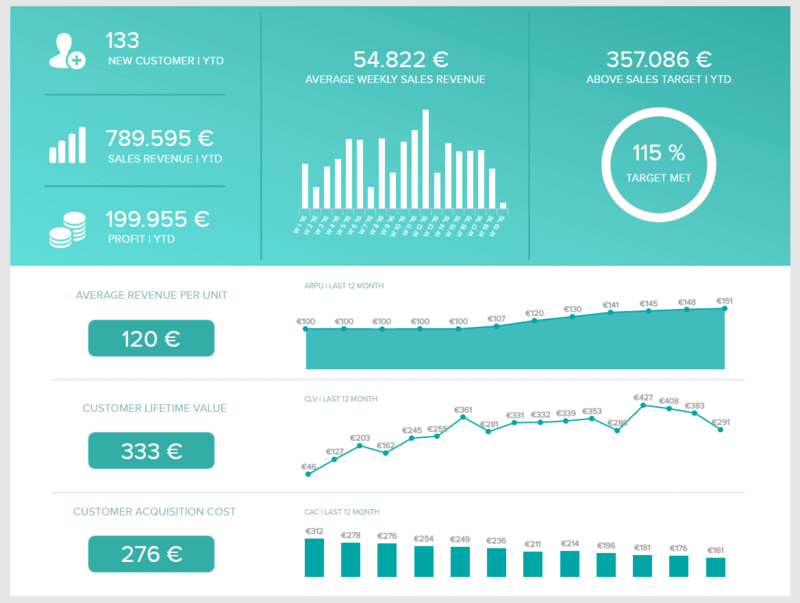 This sales dashboard depicts a rounded view of the sales performance. It combines a lot of important KPIs, like the average weekly sales revenue, customer acquisition cost and yearly overview of the revenue and profit. You can even go further and interactively explore these units on a daily, weekly, monthly or quarterly time frame. The importance lies within the analytical reporting interpretation of big data compiled into just one dashboard, and a quick summary of the key factors that a sales report should have. The sales target in this example is exceeded by 115%, which means that managers can quickly conclude their targets are on track, provide feedback to their team and generate more ideas on how to proceed with the next steps of a strategy. Incorporating this kind of report into a business practice can bring value to a company, as smart data are presented in a clear and efficient way. Combining these metrics, which provide straightforward evidence and analysis of the overall sales strategy, managers can reduce operational costs and set additional targets on how to decrease customer acquisition cost, which is one of the main goals of a sales strategy. We can go even deeper on a monthly level. This monthly report combines data of sales reps, their whole funnel, the average length of sales stages and the average sales cycle length. You can see in this analytical report template the single efficiency and conversion rates of a specific sales manager or representative, gather information on the number of opportunities, proposals, negotiation and closing time each one had. 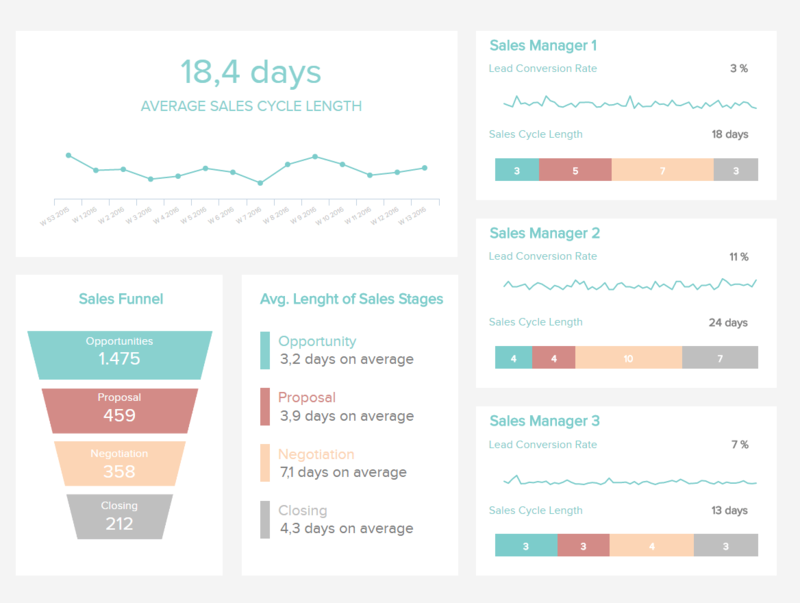 This sharp data analysis can project evidence of an effective sales cycle, meaning each member of a team can visually see their part of the sales strategy and take decisions based on the presented data. Since these kinds of reports can be used by different teams and stakeholders, the important value of clear analysis and numbers can define future actions while analyzing current data. 3. Marketing: Where should we allocate our budget? Our third analytical report example comes from marketing. Digital marketing KPIs have expanded since the use of digital media has entered into the marketing scene and reports have become more broad and detailed. Although you can combine your tracking KPIs into a single spreadsheet, it is often more useful to have a clear overview of specific campaigns, return on investment, cost per click or landing pages conversion rate. 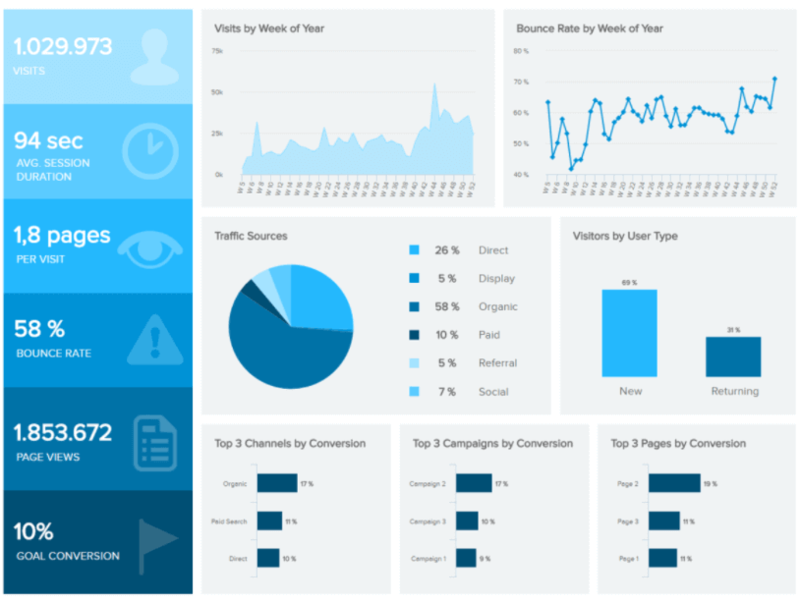 This example shows a perfect overview of a web analytics report. It quickly shows the total amount of visits, average session duration, bounce rate, page views, and the total goal conversion rate. Based on this data, a marketing department can quickly grasp into their analytics and conclude whether to make changes into their strategy or make an additional decision for a specific campaign. Monitoring traffic sources can easily define where to invest more or less, and the systematization of top campaigns, channels, and conversions can easily provide evidence of historical data based on the last year’s performance, or weekly analysis of trends. This kind of analytical reporting can bring time-consuming writing and exporting documents into the pains of the past, since the dynamics of digital reports have gone into the future of digital data and age. 4. Finance: We should reduce the operating expenses ratio. How to do it? Another notable analytical report example that we have selected comes from the finance sector. Meeting financial objectives can be established by a simple report combining all the important financial aspects of a company: gross profit margin, operating expenses ratio, operating profit margin, and net profit margin. All these indicators offer valuable and succinct insights into one central point of access which can be then analyzed in more detail by providing data and, therefore, a base for making future decisions. After seeing this visual representation of the most important key performance indicators, stakeholders, managers or employees can benefit from insights and decide whether to reduce the operating expenses or take actions into developing a new strategy to increase revenue and profit. Historically speaking, after the digital age has well entered into the business realm of collecting and interpreting data, analytical reports have become a set of must-haves for a business to thrive into the vast amount of data received every day. In the analytical report examples we provided, it is clear that these kinds of reports can be used in different industries, with specific sets of data needed to compile recommendations and bring suggestions for a precise course of action. Using business analytics tool can determine whether a company will stay on top of today’s market while reducing its costs, or get eaten by competition that uses detailed analytical information and reports to define their future. An online data visualization tool can help track the specific and holistic performance of a company which can utilize better decision-making and a more valuable business strategy. If you’re ready to create your own report, then you can try our 14-day trial completely free!